They're cute. They're adorable. They're moody. And there's a hidden feature that lets you torture them! What more could you want in a puzzle game? The Meeps undergo wild mood swings according to how you treat them. All you have to do is get them together into support groups and they'll disappear. Sounds easy? Think again! In this addictive game you must rotate and move falling tiles and form connections of the same color to clear them from the grid. Blaster tiles and Mystery tiles add unpredictability and more action to the game. Adjunct Blaster only takes a minute to learn to play. A new twist that's sure to please fans of Tetris, Columns, or Bejeweled! Did you ever wonder why some remakes make it to MTV's Top20, while others fail? It's simple - the good ones contain the soul and the vibe of the original. The bad ones don't. It is time to get acquainted with KRAKOUT - the top of the chart remake of good old classic Arcanoid. The game is overflowing with the spirit of the original. It is dynamic, action packed, fast, addictive, adrenaline filled and graphic rich. Sudoku Mate generates an unlimited number of suduko puzzles for beginners and experts. 50 different levels of difficulty to choose from. Create and edit your own sudoku puzzles and store them in a database file for later use. Solve sudoku puzzles manually or with the solver. Easy to use number pad for entering and editing numbers. Print out sudoku puzzles or copy them to the clipboard. Generate Sudoku puzzles and play them using cards instead of numbers. 5 levels of difficulty, also number and letter puzzles. Play on your PC or print out. Best times roll of honour. Multiple skins and sound effects. Coaching aids. 2004 Independent Games Festival finalist! Create matching outfits by dressing up the dolls. You are given hats, tops, bottoms, and shoes, in a variety of styles and colors. There are also several accessories you can collect to make the outfits more valuable, which scores you more points. But if you run out of dolls or shelf space, your game is over! The goal of this puzzle game is to put tiles of the same color together. It is very easy to learn, but not so easy to master! You'll be hooked for hours. Such skills as matching, simple strategic assessment and problem solving can be developed by playing the game. Jewel of Atlantis is a new and exciting action puzzle which combines match-3 mechanics with breakout-style mayhem. In this game, you explore a just uncovered ancient continent in search of valuable treasures and relics. There is a huge map available for your exploration with a number of various roads and pathways to travel. Sink below the deep sea to witness exciting adventures in mystical places like a Sacred Temple and a Sunken Volcano! This is a matching game where the player is presented with a number of face down covers. Each cover may be clicked to reveal the underlying picture. Once a picture has been revealed the player may then click another cover to try to find the matching picture. Pictures must be matched in pairs and once all matching pairs have been found the game is over. Unmatched pairs are re-covered and the child must remember the location of the pictures. This is a great introduction to the concept of eye candy puzzles. The splendor of colors and visual effects will take your breath away! Simply use the mouse and choose two adjoining pieces of fruit you want to swap, so that you'll get a matching line of fruit. Select one of three game modes and enjoy the puzzle. Playing this game is as easy as ABC. You can play this brainteaser together with your children. Pure energy of joy! Play it! Feel it! Simple to play, but hard to master. This addictive puzzler has elements of many of your favorite puzzle and solitaire games. Your goal is to remove all of the colored balls from the pyramid. Remove colored balls by matching two balls of the same color at the bottom of the pyramid. Use the balls from the pipe to help you solve the puzzle, but manage them wisely because you'll need them all! Crime spree baffles Huntsville police! Do you have a keen eye for details? See if you can locate enough hidden clues to solve the crimes and become a Master Detective! Mystery Case Files: Huntsville provides gamers with a collection of intriguing mysteries and brain-teasers to solve. There are picture puzzles to ponder, strange crime scenes to explore, and much, much, more! Enter a beautiful fantasy world where Goblins, Dark Genii, and worse use powerful spells in their quest to incinerate your beloved Academy. 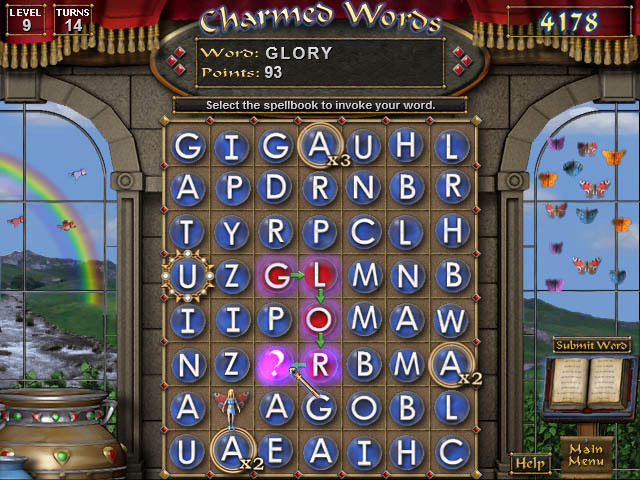 Create words on your magical rune board to cast your own enchantments and dispel the darkness. Collect valuable treasures to amplify your powers and get help from Butterflies, Faeries, and Puff Dragons. This new, free, nice game is developed by SplineGames.com. It is a real puzzle that will absorb all your attention to solve it. As each level is more complicated than the previous one the game will keep your constant interest as well as your skill level will improve. The purpose is to clean the board from the balls - only one ball should be left. Balls jump over the ball if the following cell is free. Nothing prevents from trying - it is free!